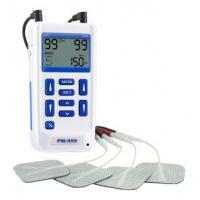 Pain Relief and Muscle Stimulation. Adjustable timer, 5 minutes each step and constant. System includes: stimulator lead wires, 9V battery, 4 self-adhesive reusable electrodes, instruction booklet, hard carrying case. 9V AC adapter: 9V rechargeable battery kit available. TENS/EMS Units & Stimulators can be found in our extensive online collection of products from globally recognized and trusted brands, including ProMed Specialties. An excellent option to consider is the Three Mode Digital EMS Unit with Timer, Dual Channel.